Betty June Nees, 90, of Lima, was surrounded by her family when she passed away at 9:02 AM on Sunday, February 10, 2019, at her residence. She was born on August 27, 1928, to Forest Baber and Ida (Dunlap) Baber, who both precede her in death. On October 27, 1948 she married the love of her life, Robert Nees, who also precedes her in death. Betty lived a life filled with many passions and experiences. She enjoyed making ceramics, reading, and she loved traveling. She loved the Lord and was an attendee at Forest Park Church. 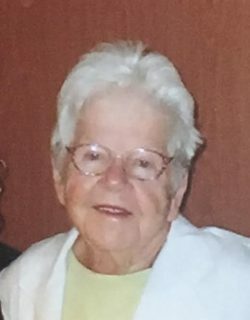 She was known for her green thumb, as she was a member of the Lima Garden Club for many years. She helped start and maintain the Perry Elementary Greenhouse. She enjoyed her role as a 4H advisor for the Perry Blue Ribbons. Ever dedicated to the Perry school system, she was a member of the Perry Mom’s Club and she worked in the school’s cafeteria for many years. She felt the most pride in her role as a homemaker. She loved spending time with her family more than anything else. Survivors include her sons Michael L. Nees of Lima, and Thomas E. (Kimberly) Nees of Plain City; her daughters Susan Kay Nees of Lima, and Sally Jo (Bryan) Rumbaugh of Lima; her daughter-in-law, Rita Nees of Lima; as well as her grandchildren Bryan (Denise) Rumbaugh of Little Hocking, Ryan (Rachel) Rumbaugh of Lima, John Michael Nees of Columbus, Kelly (Tom) Stevenson of Delphos, Luke Nees of Plain City, Josh Nees of Plain City, and Grace Nees of Plain City; as well as five great grandchildren. Betty was preceded in death by her husband, Robert Nees; her parents, Forest and Ida Baber; her son Robert F. Nees Jr.; and her siblings, Leo (Frances) Baber, Earl (Margaret) Baber, Robert (Gladys) Baber, Edgar Baber, Virgil Baber, Pauline (Elmer) Reese, and Eldora (Porter) King. The family will receive friends from 2:00 PM to 4:00 PM and again from 5:00 PM to 7:00 PM on Thursday, February 14, 2019. Funeral services will take place the following morning at 11:00 AM on Friday, February 15, 2019 with Richard Rakay of Delphos United Methodist officiating. All services will take place at CHILES-LAMAN FUNERAL & CREMATION SERVICES, EASTSIDE CHAPEL. Interment will take place at Memorial Park Cemetery following the funeral. The family would like to express their gratitude and sincere thanks to Putnam County Hospice for so graciously taking care of Betty during her final days. In lieu of flowers the family requests that memorial contributions be made out to Putnam County Hospice, Perry Township Fire Department, or a donation towards a cause of your choosing.